Today should, hopefully, be my last full day in Antarctica. I’m scheduled to fly back to Christchurch tomorrow afternoon. Flights to and from Antarctica can often be delayed by bad weather or mechanical problems with the planes so there is no guarantee that I’ll actually fly north tomorrow. With that said, the weather forecast looks good so I’m cautiously optimistic about sleeping in New Zealand tomorrow night but I never truly believe that I’m leaving Antarctica until the plane takes off from the ice runway. As I’ve discussed in previous blog posts our field season has had some ups and downs. The injury to my hand (which is healing well) set us back a bit and we lost about a week of flying time due to that and some bad weather in the middle of the month. Despite that setback we managed to do 33 SUMO flights on 10 days. These flights observed a wide range of conditions that will allow us to meet our scientific goals for the project. The flights were conducted during both daytime and nighttime conditions with temperatures ranging from as cold as -51 degrees F to as warm as +5 degrees F. While most of you wouldn’t think that 5 degrees F feels warm after almost a month of nearly continuously below zero weather a temperature of +5 degrees F actually feels pretty comfortable. In fact, for the last week or so I’ve been walking around town in a light fleece jacket rather than my large parka. I’d like to end this field season’s blog posts with some of my favorite photos from this trip. Hopefully these photos will convey some of the beauty I’ve been lucky enough to experience while in Antarctica. These late winter (WinFly) trips are my favorite Antarctic trips since we get to see sunrise and sunset every day and get to enjoy the dark Antarctic night sky, stars, and aurora. When we first arrived in late August the sun was only up for less than 6 hours each day, but the day length was increasing by 20 minutes each day. At these high latitudes dawn and dusk are drawn out for several hours as the sun follows a very shallow arc across the sky and below the horizon. The Earth’s shadow underneath the pink glow of the rising sun. The blue Earth shadow extending up on the far right side of this image is the shadow of a mountain (although I couldn’t figure out which one – maybe Mt. Erebus). A view of Ross Island at sunset. 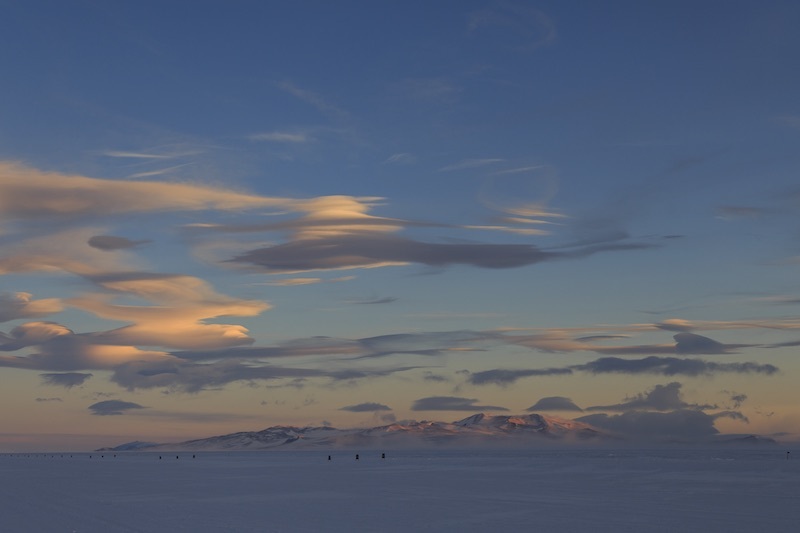 Mark is standing at the left side of this image and the sun is setting behind the Transantarctic Mountains. Ross Island, with Mt. Erebus, is in the center of the photograph. On the right side of the image you can see the blue shadow of the Earth above the horizon and the pink glow of the sun still illuminating the higher levels of the atmosphere. A thin crescent moon is visible at the top of the image about a third of the way from the left side of the photograph. By the end of September the sun was getting higher in the sky but we still had beautiful sunrises each day. 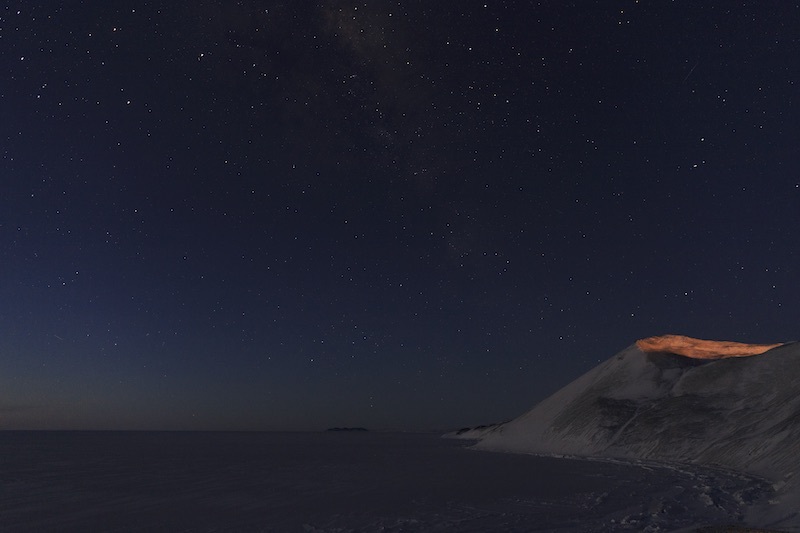 Here the Royal Society Range of the Transantarctic Mountains is being lit by the low early morning sun. This photograph was taken from the Pegasus runway where we were doing all of our SUMO flights. Definitely a pretty location for a day’s work. This is another view of sunrise from the Pegasus runway. Black Island is the leftmost high point on the horizon. To the right of Black Island is Mt. Discovery (the cone shaped snow covered peak), the Royal Society Range (center of the horizon), and Ross Island (left edge of photograph). There are several interesting optical phenomena that occur here. One is a mirage called a fata morgana. This is the opposite of the water mirage that is often seen in desert or hot locations. For the water mirage light from the sky gets bent and appears to be coming up from the ground creating a blue, shimmering appearance on the ground that is mistaken for water. The fata morgana occurs when light is bent such that it appears higher than its actual source. The result is that features near the ground appear to be taller than they really are. Fata morgana at the base of the Transantarctic Mountains. In this photograph the fata morgana mirage appears just above the base of the mountains and you can see it most clearly as a mirror image of the bare rock in the center of the photograph as well as on the right side of the image. 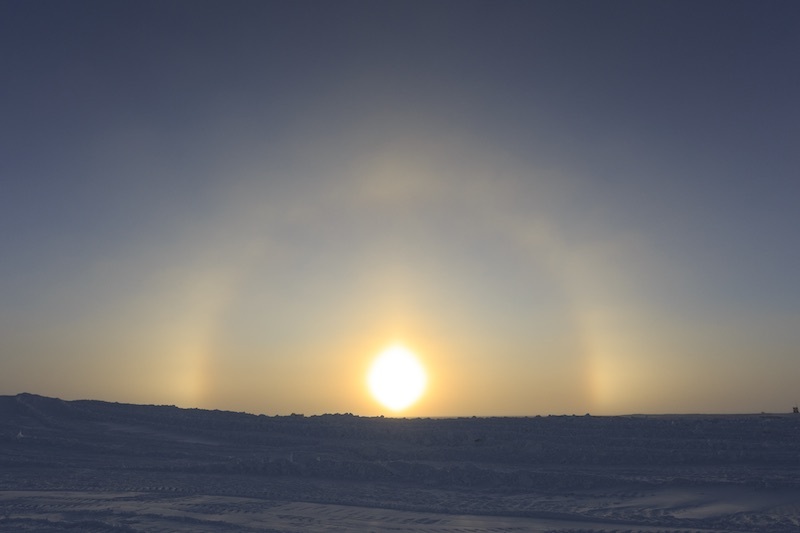 As sunlight passes through ice crystals suspended in the atmosphere it can create a halo around the sun or moon and under some conditions creates bright rainbow colored spots of light to the left and right of the sun. These bright spots are called sun dogs. A halo and sun dogs at sunset from the Pegasus runway. One of my favorite things to see when I’m in Antarctica at this time of year are polar stratospheric clouds. Meteorologists divide the atmosphere into different layers. We live in the troposphere, the lowest roughly 30,000 feet of the atmosphere. This is where almost all of the weather we experience occurs. The next layer of the atmosphere is the stratosphere. The ozone layer is located in this portion of the atmosphere. Normally no clouds, or any other things that we typically think of as weather, occur in the stratosphere but in the very cold polar stratosphere clouds can form. These clouds form at altitudes of 50,000 to 80,000 feet at temperatures colder than -100 degrees F. These clouds are composed of a mixture of ice and nitric acid. Their unique composition gives them a mother of pearl coloration which lends them their alternate name of nacreous clouds. On this trip I only saw polar stratospheric clouds on one day. 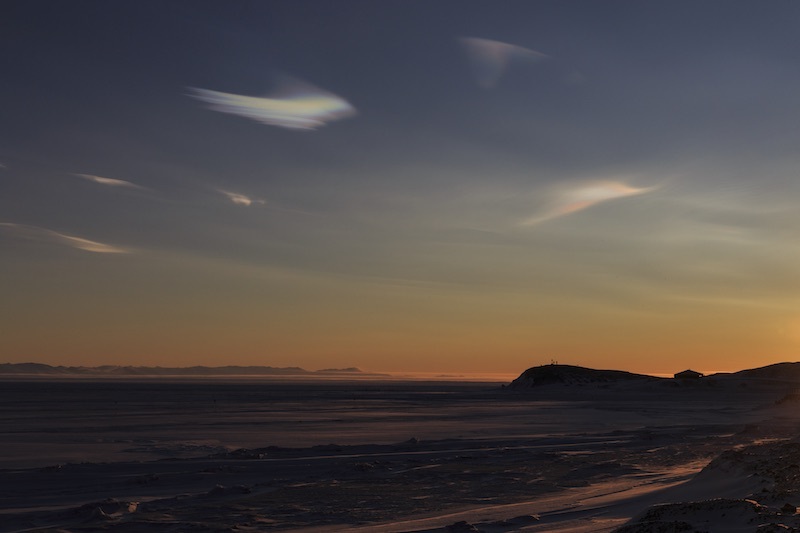 Polar stratospheric clouds over Hut Point at sunset. Less rare than polar stratospheric clouds are wave clouds that form in the troposphere. These types of clouds can be seen anyplace with sizeable terrain and they form as strong winds blowing over the hills or mountains is disturbed. This creates waves in the air that are similar to the rapids seen in streams and rivers. I see these types of clouds at home in Colorado on a regular basis from fall through winter and into spring when strong winds blow across the Rocky Mountains. They are always beautiful but are especially so at sunrise or sunset. Wave clouds over Black Island at sunset. From the Pegasus runway we had a nice view back to Ross Island and McMurdo. The two photographs below show this view at sunset and several hours later once it was dark. McMurdo Station and Mt. Erebus at sunset from the Pegasus runway. 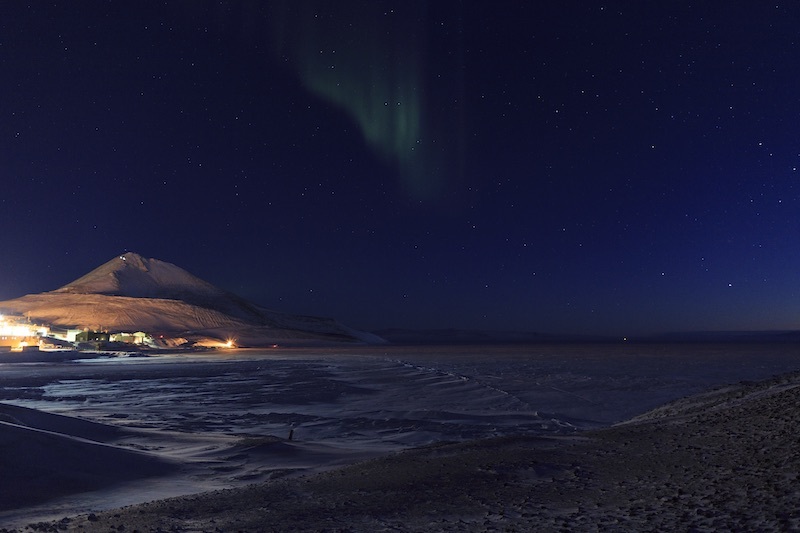 McMurdo Station and Mt. Erebus at night from the Pegasus runway. After sunset I love stargazing under the dark Antarctic sky. 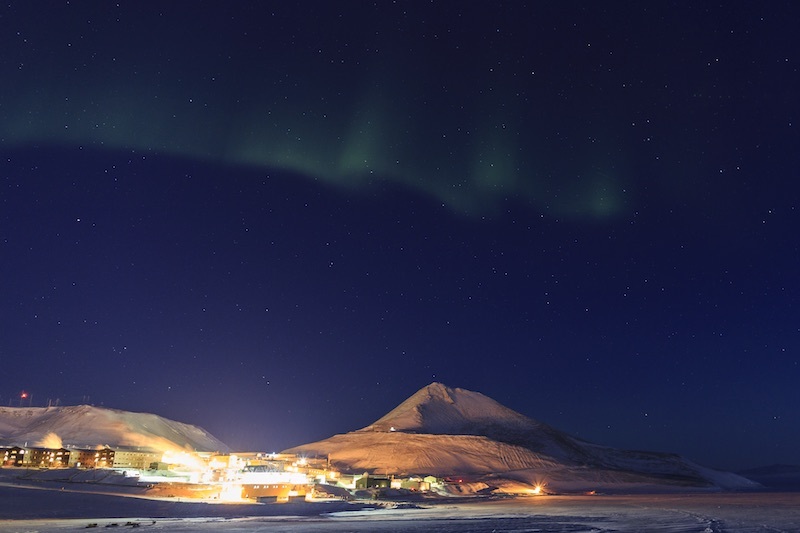 Below are a few photographs from a night of stargazing in early September when the temperature was around -25 degrees F.
The lights of McMurdo Station under the Southern Lights (aurora australis). The aurora rarely stays the same for very long. On the night I took the previous photograph the aurora was waving back and forth from over the sea ice covering McMurdo Sound to over the hills behind McMurdo Station. This display of the aurora lasted less than 10 minutes so I was lucky to capture several photographs of it. A view of the stars looking north from Hut Point. The next land north from here is New Zealand – over 2000 miles away. In this photograph you can still see a lingering glow on the horizon from the sun that set several hours earlier. This will probably be my last blog post from this trip but I’ll be returning to Antarctica in January with the New Zealand Antarctic Program. For that trip I’ll be flying my SUMO UAVs in the Dry Valleys in the Transantarctic Mountains. I’ll be working with colleagues from the University of Canterbury, in Christchurch, that are studying the boundary layer in these desert mountain valleys. I’ll be posting new blog entries during that trip. 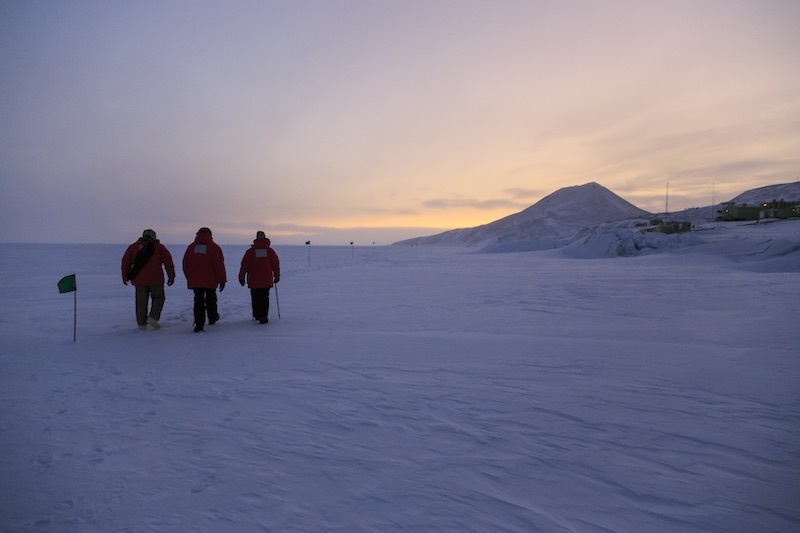 Hiking on the sea ice near New Zealand’s Scott Base on Ross Island. 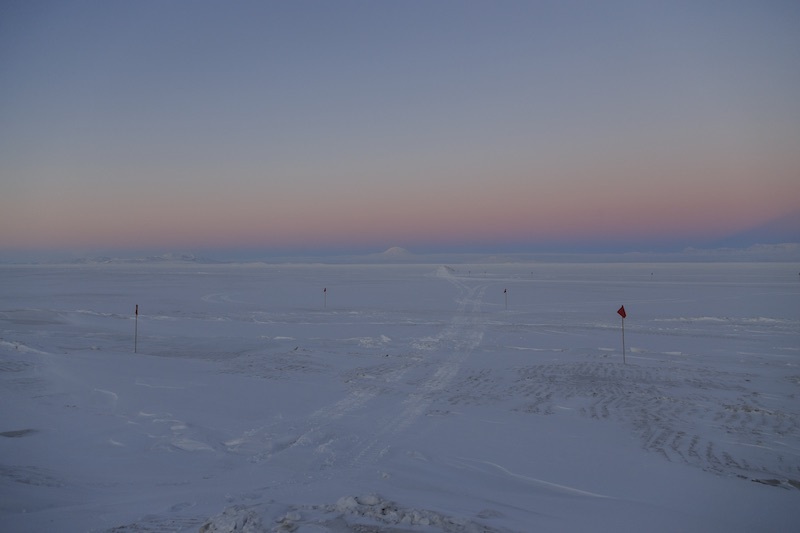 Scott Base is the cluster of green buildings at the right edge of this photograph. I hope you have enjoyed reading about my experiences in Antarctica over the last several weeks and I appreciate all of your comments and questions, especially from the kids at Coal Creek Elementary School in Louisville, CO. Skyping with them was one of the highlights of my trip. This is truly amazing! I am so excited to get to show the kids the pictures of Antarctica! I will keep them on hand to share as we begin our Antarctica unit in January! Thank you so much for sharing your expertise and adventures! Safe travels and come to visit us at Coal Creek! Thank you for including me in your trip South! All you see and do in Antarctica is so amazing, 33 flights in 10 days! I also found the polar stratospheric clouds especially interesting since they are made of nitric acid and ice. I will definitely have to look into more about them! Thank you for sharing your trip! Amazing photography, John! Thank you for your great work and writing out there. It’s been a delight to follow. Hope the hand continues to heal well! Beautiful pics John and nice to read all about the field work!